This article was originally published by YaleGlobal Online on 17 April 2018. Putin, studying Trump’s foreign policy actions, is poised to take full advantage of strategic ineptitude. Iran and Turkey are playing a crucial role in strengthening Putin’s hand in this intricate power game. 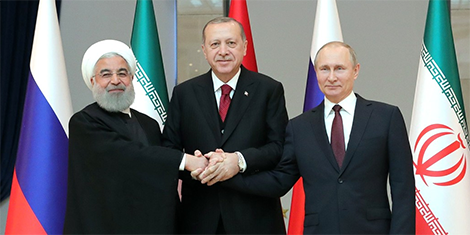 The nexus among Iran, Russia and Turkey has the potential to become a potent entity, except that it also suffers from several problems related to clashing strategic perspectives and internal contractions of its three members. These internal contradictions could be dangerous for the alliance’s abiding survival. Turkey’s chief reason to join this nexus is its desire to destroy the prospects of rise of a Kurdish state in its neighborhood. The Kurdish population – estimated to be 35 million – lives in portions of Iran, Turkey, Iraq and Syria. In the post-Saddam era, the chances of the emergence of an independent Kurdistan have escalated. However, none of the aforementioned countries support that issue. Turkey became vocal on this issue during the Obama presidency. President Recep Tayyip Erdoğan not only understood the real Kurdish strategic objectives in becoming a proxy of America’s military action against ISIS in Iraq and Syria, but he pointedly told the United States that his government would do everything to crush the Kurdish forces – and eventually determined that the United States was either ignoring Turkey’s strategic concerns or insisting on using the “Kurdish card” in its proxy wars against ISIS and Syria. This issue steadily promoted dissension between Ankara and Washington. When Trump became president, he continued Obama’s policy of using Kurdish forces as America’s proxy for weakening and ousting Bashar al-Assad and eradicating ISIS from Syria and Iraq. Erdoğan also deeply resented the fact that the United States and NATO allies did not side with the Turkish government in condemnation of the failed military coup in July 2016. His government was suspicious of the West’s sympathies with the forces involved in the coup. Then, when Erdoğan blamed the exiled Turkish cleric Fethullah Gülen for being chief instigator of the coup and demanded deportation, the United States refused to oblige without seeing proof of Gülen’s alleged involvement. The United States has envisioned Turkey’s growing predilections for pursuing a highly independent foreign policy as a precursor to its emergence as a defiant ally of the lone superpower. Erdoğan represents a new Turkey, which wants to be recognized by the West as a major Muslim ally. But he also used the aborted military coup as an excuse for bolstering authoritarian rule inside his country. And that development strained his already troubled relations with the West. Erdoğan’s preference for autocratic rule and his sustained chokehold on all democratic forces inside his country have convinced the US strategic community that Turkey may be in the process of reexamining its longstanding membership in NATO. Such a conclusion may be premature, but Turkey under Erdoğan has emerged as an assertive power, with its own priorities about the modalities of regional distribution of power. In the pursuit of those priorities, Turkey envisions itself as eventually emerging as the center with neighboring Arab and Kurdish forces playing a subservient role. Iran, another regional power, has been driven by various strategic objectives, including religious interests in its dealings with Turkey and Russia. Iran is motivated by securing a permanent foothold in Syria from where it can influence the stability of Syria and Lebanon as well as monitor the dynamics of the Palestinian-Israeli conflict. There have also been suggestions that Iran intends to secure “an arc of influence across Iraq and Syria that would end at the Mediterranean Sea.” This alleged objective would also serve as Iran’s independence from the political struggle between the Shias and Sunnis inside Lebanon. Thus, Iran and its proxy Shia militias and the Hezbollah of Lebanon have made a major investment of human lives and hard cash to ensure Assad’s survival. Any potential ouster of Assad is likely to create an unfriendly strategic environment for Iran. Syria is not only a predominantly Sunni state, but also a place where the remaining Islamic State forces and a number of other Sunni Islamists are very much alive and well. By fighting to preserve the Assad regime, Iran is extending the legacy of Hafez al-Assad, Bashar’s father and a notorious tormentor of Syria’s Sunni Islamists, thereby ensuring its own presence in that country. But Iran’s activities have only intensified Shia-Sunni sectarian strife in the Middle East and South Asia. Iran’s support of Assad is part of its larger strategic objectives of defeating Saudi Arabia’s escalating designs to compete with Iran in the Persian Gulf and the Levant. The most significant uniting force for Iran, Turkey, and Russia is their resolve to safeguard their respective regional strategic interests, and for Russia, an additional and overriding motivating factor is to be recognized once again as a superpower. An ongoing tug of war between the Trump White House and America’s security state provides Putin with an outlet to exploit. As adamant as Trump has remained about imposing transactional costs on all global actors – and that includes US allies – he has remained receptive about engaging Putin though relations have frayed with rising tensions over Russia’s role in Assad’s chemical attack. One could argue that a feature of the Trump administration has been its drive to dominate the security state by firing various high officials whom Trump regards as not “loyal” to him personally. It is impossible to predict whether the Iran-Turkey-Russia nexus would provide these countries any long-term advantages in the Levant and in the Middle East. These regions are becoming hard to manage by foreign powers. Obama may have correctly read that development and refused to get involved. Trump policies have not differed markedly from his predecessor’s, and the president may be realizing how right Obama really was, but resists giving him credit. Putin remains a visible player who has not yet come to grips with the intractability and unresponsiveness of the Middle East to any great power’s desire to dominate. Great power hegemonism in the Middle East may well become an artifact of a bygone era. There may not be any winner in the Middle East. Ehsan Ahrari is adjunct research professor at the Strategic Studies Institute of the US Army War College, in Carlisle, Pennsylvania, and the CEO of Strategic Paradigms, an Alexandria, VA-based foreign and defense policy consultancy.